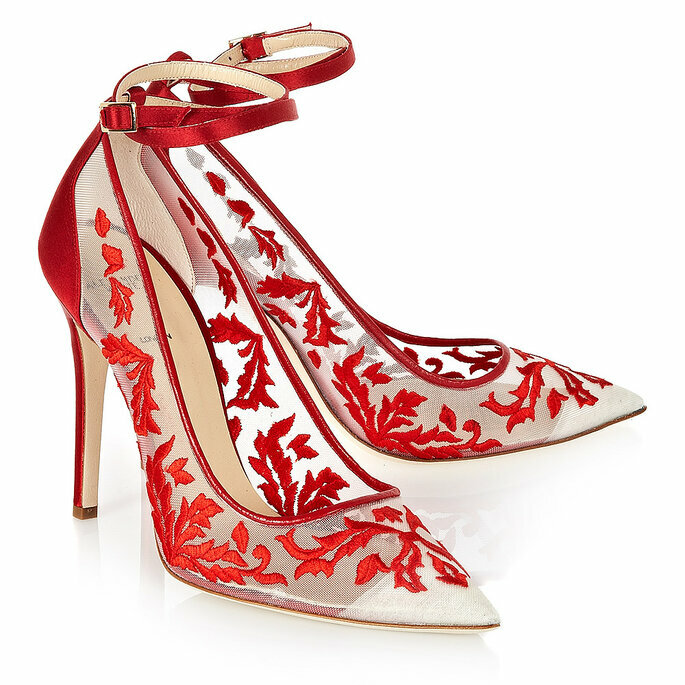 The Best Bridal Shoe Designers in London: Pick the Perfect Pair Today! Searching for the perfect pair of shoes for your wedding day? Then don't miss out on our summary of the top designers in London! Shoes can make or break an outfit, and so on a day as important as your wedding, it is vital that your heels match your headdress, and that you bring it with the footwear. Whether you’re getting married in platforms, kitten heels, or ballerina flats, you need to ensure you have two things: comfort, and style; remember that you’re not just walking down the aisle in this pair, but will probably be dancing the night away in them too! Finding the right time to choose your shoes can be a little tricky, so we would recommend that you wait until you have found the dress, but no later than a month before the big day so you have time to wear them in if need be. And we cannot stipulate this enough – quality is key. ASOS is perfect for your bridesmaids, but not for you! 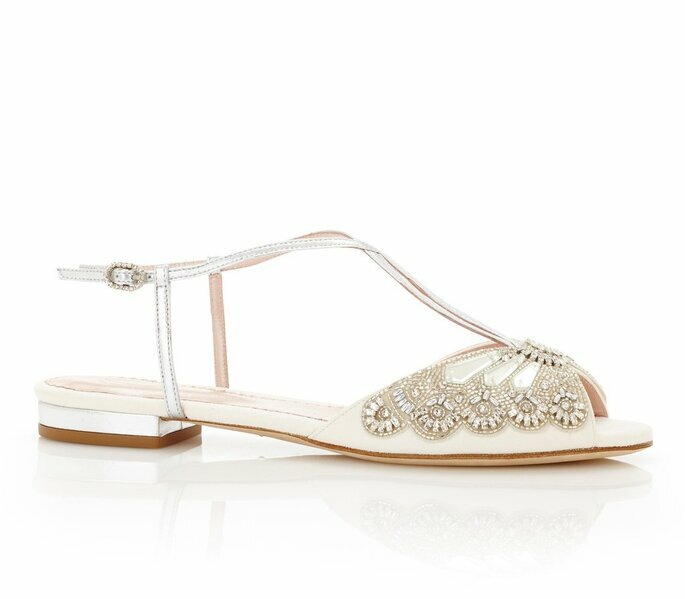 So take a look at our roundup of the 8 Best Bridal Shoe Designers in London for inspiration on your perfect look – and recommendations of just where to go! 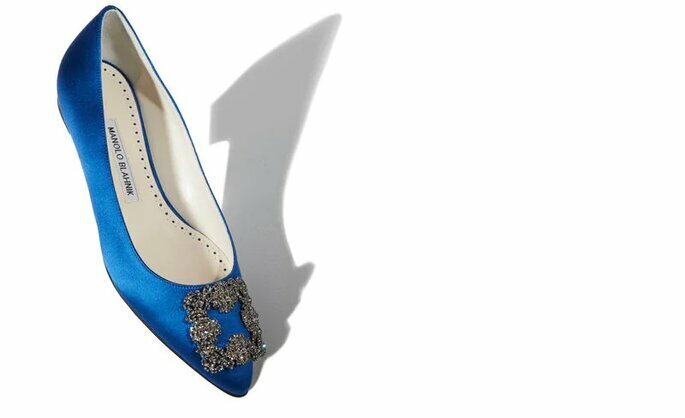 Carrie Bradshaw’s perennial favourite, Manolo Blahnik is another London-based designer brand who will allow you to positively sparkle on your big day. The 2019 collection is designed not for classical brides looking for the perfect ivory mid heel; it is, however, the place to look for brides who want a something a little alternative. Bring a bit of personality to the ceremony with a tassled heel as below, or try something in a bold colour (which, *hint hint*, is going to be a big trend for next year!). Either way, we guarantee that your shoes will be bringing you plenty of attention – and will be comfy enough for you to get the party started! Camilla Elphick is an up-and-coming shoe designer who founded her company in London in 2014. Vintage meets modernity her; these shoes are perfect for millennial brides looking for quirky, out-of-the-box designs for their wedding day. 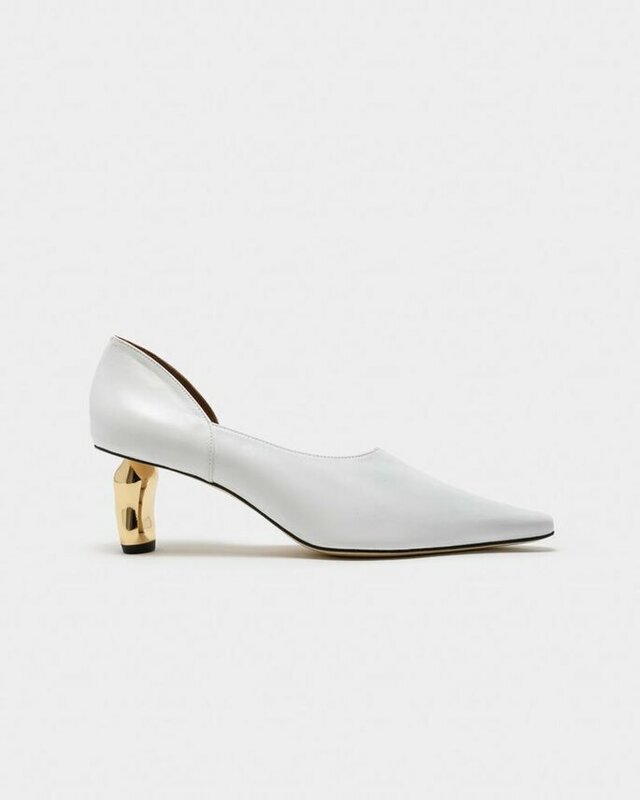 These heels would match perfectly with a vintage-style wedding dress, or a gown from Temperley Bridal’s new line for FW19. Either way, here you will find shoes in different colours, and a vast array of heel heights and straps – and all at a price that will not break the bank either. So if you want designer quality, and a unique shoe, all for less than you will pay at a designer boutique, Camilla Elphick is the person for you! Alexander White is another newbie on the London shoe-designing scene, but by no means should this put off his exquisite designs. Sketched here in London, and brought to life in Florence, these shoes are perfect for the 21st century bride. White prides himself on mixing traditional design techniques with modern aesthetics to create shoes that have personality – and a bit of a kick! The SS18 collection is full of the floral influences that you will find in the rest of the bridalwear industry, and is infused with romantic and sensual colours and patterns. 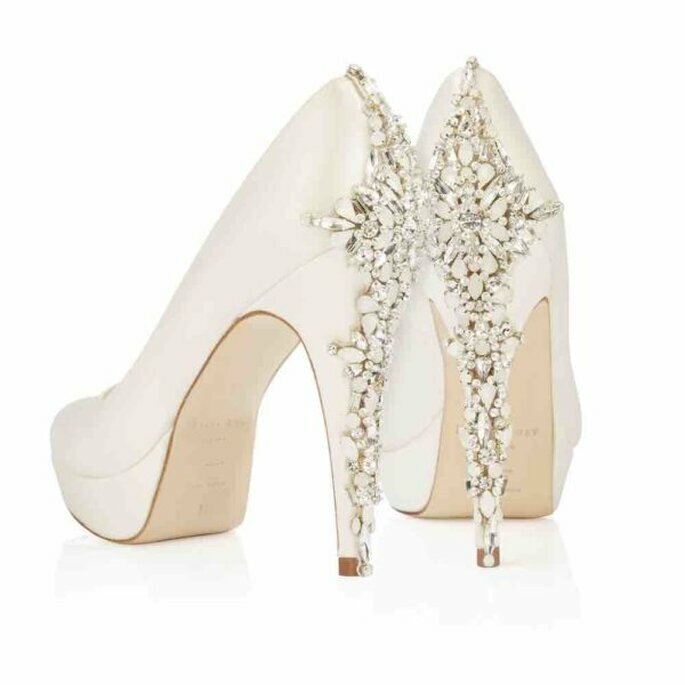 Make a statement on your wedding day with a pair of these beautiful heels! All hail the Queen of Embellishments! Freya Rose not only produces some of the most comfortable designer shoes we have ever found, but knows exactly how to style them too. 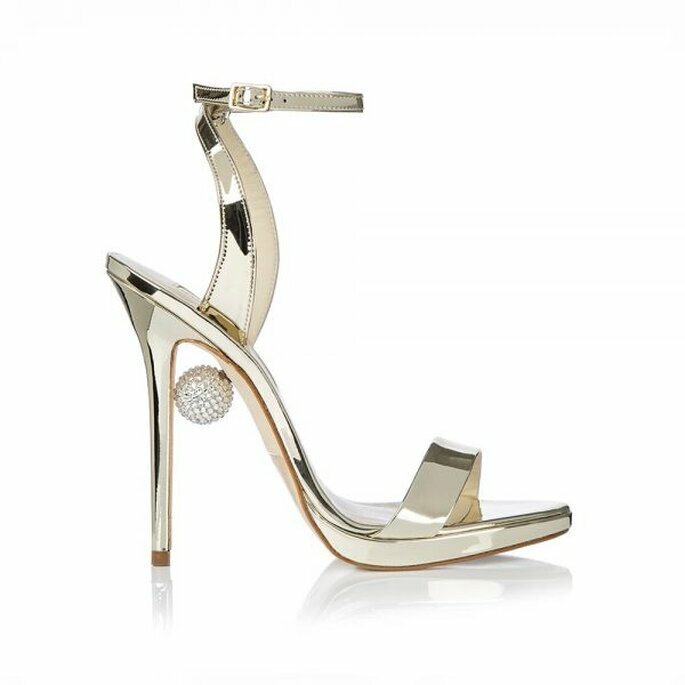 Put together in Spain, and then shipped to the UK for decorating purposes, Freya Rose combines a family obsession with jewellery, and her own adoration for shoes to create the ultimate bridal staple. Working with the finest materials – from Swarovski crystals to fresh water pearls – each pair of shoes takes 20 hours to make, and are finished by hand by experts. These shoes are the epitome of luxury, and are a must-have for your classic wedding ceremony. Harriet Wilde is another designer who knows how to play with decoration, erring more on the side of the floral-themed additions than the aforementioned Freya Rose. And most importantly, this designer focuses entirely on wedding shoes – so you can be assured that every pair in her boutique or online store have been created with the sole intention of getting you to the top of the aisle. Comfortable, versatile, and absolutely beautiful too, Harriet Wilde’s combinations of rich colours and sparing embellishments create stylish shoes that draw attention but will not detract from your dress. Make an appointment at her atelier today! Amy Bordo Decade. Credits: Harriet Wilde. Emmy London’s wedding shoes cover an immense range of styles, but the latest collection for 2019 just screams 1920s! 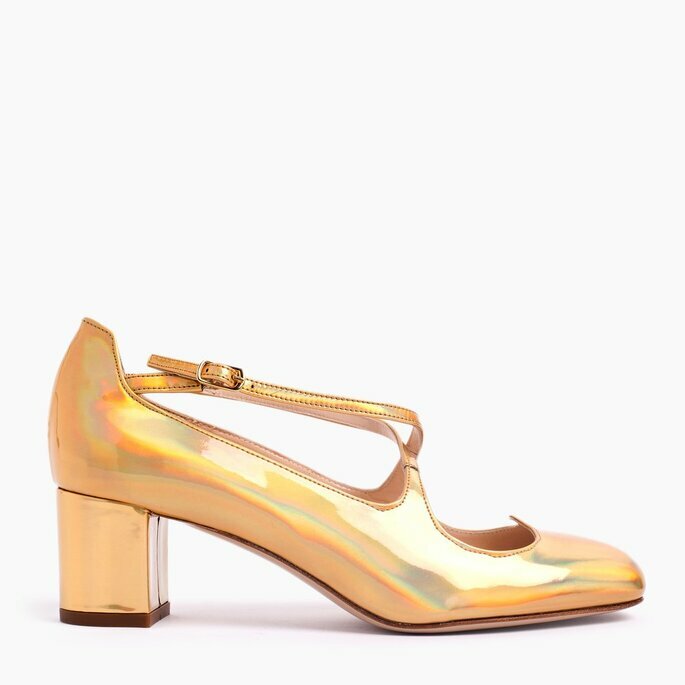 Harking back to a Golden Age for glitz and glamour, these classic shoes are perfect again for vintage dresses, or for sprucing up a simple dress with some fabulous accessories. Priding themselves on being a quintessentially British brand, Emmy London’s founder Emmy Scarterfield worked for Armani in Milan before returning to the UK to launch her own company in 2004. Since then, the brand has been internationally recognised, and is one of the pilars of the bridal shoe community. There’s no time to waste! And to end our recommendation list on an absolute high, we present Rejina Pyo. Storming the fashion industry with her bold and innovative designs – inspired by abstract art and perfect for the contemporary woman – Rejina Pyo’s shoe collections are the perfect place to source a pair of shoes you can be guaranteed no other bride will have. You’ll cause a commotion with these unique tamarind heels, and we love the contrast between the classic silhouette – slingbacks have always been in for weddings! – and the modern finishing touches. Make sure all of your guests know that you’re not a basic bride and opt for something totally singular! 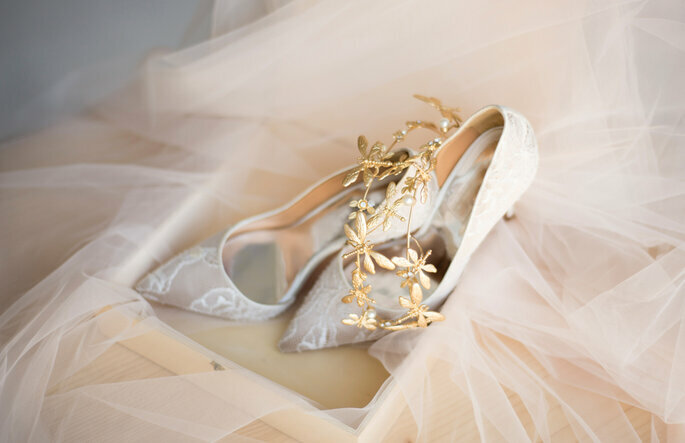 Choosing your wedding shoes is one of the most fun parts of the whole wedding planning experience – and will be a real treat if you visit one of the designers on this list! Get to know more about them by clicking on their pictures, and find the perfect pair for you today. The complete guide to finding your perfect wedding dress in London. 7 renowned designers, 7 amazing bridal boutiques. Find our favourite international bridal designers all over this city of bridal dreams.